The Encyclopedia of Ghosts and Spirits, Third Edition includes more than 600 fascinating entries about ghosts, hauntings, related paranormal phenomenon, the people who investigate them, and the key theories about what causes them. Widely regarded as the definitive reference in the field, this encyclopedia provides comprehensive coverage written in an engaging style. 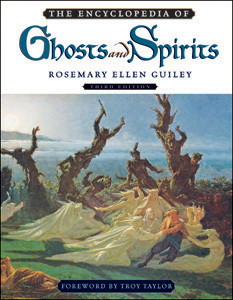 Paranormal expert Rosemary Ellen Guiley has compiled extensive research on the most current theories about what causes ghosts and the many new haunting cases documented since publication of the second edition. The third edition has been substantially updated with the addition of more than 130 new entries, more than 20 new black-and-white photographs, and an updated foreword by Troy Taylor, author and founder of the American Ghost Society. Many entries include bibliographical listings for further reading. "Believers and skeptics alike seeking information on various phenomena will find this book useful...fascinating..."
"This riveting volume provides a much-needed expansion and update of one of the best references on the subject. Well researched and engagingly written...comprehensive...an outstanding tool for serious researchers and laypeople alike." "...easy to read...a plethora of good information..."